I was taking some photos this morning on the way into work and managed to get a picture of something I noticed a few weeks ago. It’s a sign, painted on brickwork, for a cafe that was established in 1854. 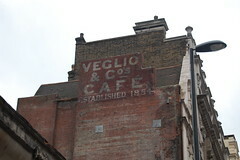 Veglio & CO’s Cafe. This sign has only just become visible due to some demolition work being carried out on the rebuild of Tottenham Court Road Underground station. It’s strange to think that this particular sign was probably covered up after the last war, only to be uncovered 60 years later. I was wondering to myself if any older person has seen the sign and remembers it, or even remembers going to the Cafe. This sort of signage is nothing new of course, it’s practically everywhere. In fact I remember seeing an almost identical sign in Chelmsford a few years ago after some demolition work, it was only there for a couple of weeks before being hidden again for another 20 years, or however long it’ll be before the ‘Internet Ready’ lifestyle apartments see the wrecking ball. It looks fairly precarious so will almost certainly be taken down, and I can’t decide whether or not that’s a shame. Part of me thinks it should remain as some kind of museum piece, but then I think about how today is so far removed from the society of 150 years ago there’s not really much point. It is a city after all, and there’s no point living in one unless you’re going to accept continuous progress. We can only keep hold of so much that attatches us to the past. However, to contradict myself I’ve always thought that if I ever had a property with a sign like this I’d repaint it and restore it to it’s former glory – Champion Spark Plugs, Marmite or even Bryant and May Safety Matches, products from an austere and far less wasteful era when war was easy to understand and bullying was just a little bit of fun. PS. There’s a Bryant and May sign down in New Cross just down from the Amersham Arms.